Learn how to create Courses in the Zunos Admin Portal. Courses let you create bite-sized training programs, using your content and quizzes. Pre-requisites: Before creating your course, make sure you have your course assets available in Zunos. Course assets would be any learning material, PDF, videos etc which you would like to include in the course and also any Quizzes that you will be using as part of the assessment. After you've created your course you can always come back and add or remove course assets at a later stage. 7. To edit the module, click on it and a settings panel will appear. here you can edit your course name, description, active/inactive and if the course elements will follow a sequential order by the end-users. Tip: Sequential here denotes the order the module will follow based on the order that has been set. 1. 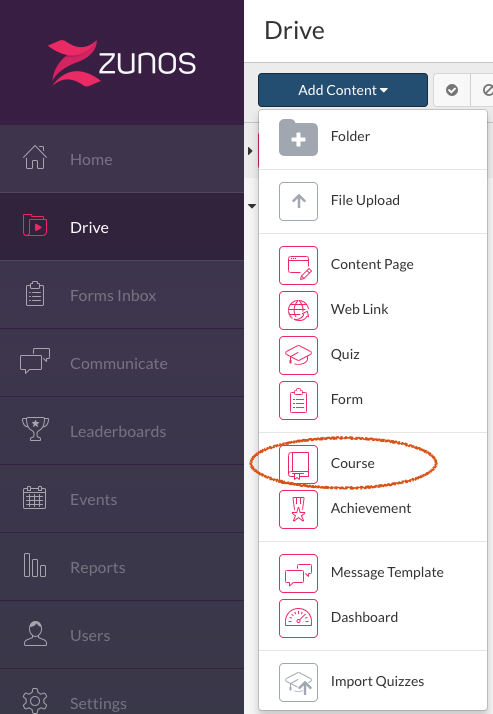 To add learning material to your new course module, you will have access to your content from the Drive Content panel on the left side of the screen. 3. The content items can easily be rearranged after they have been moved across. This can be done by clicking the 3 dots on the left-hand side of the module created and moving the content to the desired location. 4. Set your course notification message. This will be used as the default notification message when alerting users to the new course via the Notify option in Drive. 5. Allocate your Groups and Teams. If your course is available for all users, you may leave this field empty. 7. Set your course length Short, Medium, Long. This is an arbitrary time estimate indicator shown to your users to indicate how much time needs to be allocated to complete the course. Note: With Sequential Completion toggle, please take note that if you'd like to ensure users view the content first, don't attach content to the quiz questions. If the content is linked to quiz questions, users will see the "take quiz" banner that is presented if a content is linked to a quiz which will allow users to skip ahead. 9. The Add to Users "My Courses" List option means that learners will see this course in their 'My Courses' list. If this setting is off, learners have the option to add this course to their list.